The various Latin rhythms, such as variations on the Samba, are delightfully tricky and the solos are mostly on keys with a percussion background. No particular lyrics stand out on these love songs but neither do any words jar the senses. Journey Back Home, for instance, is a slowish love song with a light touch; Meditation, slow, quiet and heartfelt; Inutil Paisagem, effectively done with guitar accompaniment. The final track, Burden of Choice, has an effective sound of wood tapping percussion accompaniment that continues long after the singing has stopped - a real Latin feel. Other titles include Hold Fast; Breathe Your Kiss; Last First Glance. Mills has surrounded herself with distinguished musicians: Mueller (Herbie Hancock); Brandao ( Sidney Opera House and other prestigious venues); Porthino (played with many jazz greats); and Barata began playing drums at the age of 5. This is Mills sixth album. A winner of various Houston Press Music Awards, she performs regularly in New York and throughout the US. 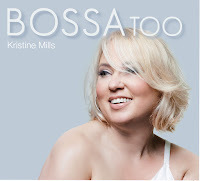 Kristine Mills – BOSSAtoo, available on the Inkwell Publishing label.